Rotation view of a female face completely covered with the organic beauty mask by professional beautician in beauty spa. Facial therapy, modern cosmetology. Skincare, skin rejuvenation. Cosmetologist in a clinic using the facial massaging tools for rejuvenation of the female skin. Hardware cosmetology, staying young. Lifting procedure. Health activities. Woman with flawless skin enjoying ultrasonic facial. 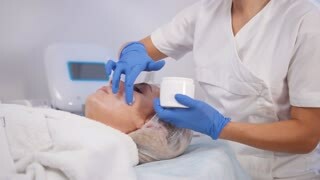 Cropped shot of a young woman having ultrasonic facial hardware procedure on her face done by professional cosmetologist.